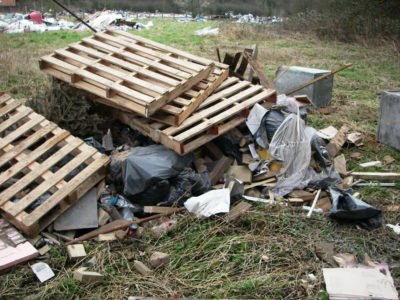 Fly-tipping in Buckinghamshire is addressed by a partnership between the district and county councils. Waste dumped on public land is cleared away and disposed by the councils at public expense. 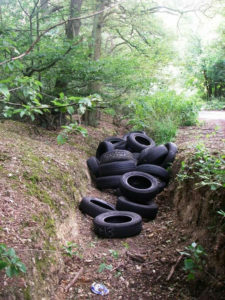 A consistent policy of ‘Zero Tolerance’ against fly-tipping has applied in Buckinghamshire for over ten years and robust enforcement is pursued – based on prosecuting cases at court. In the last three years (2015-2018) 182 fly-tipping cases have been prosecuted – resulting in total fines and costs imposed at court of £315,000. Buckinghamshire investigations result in convictions for dumping (and duty of care failures preceding fly-tipping) on average better than one case a week county-wide. The split between prosecutions of dumpers and of Duty of Care failures is around 60:40 with 62% of cases taken against the illegal deposit of waste (s.33 Environmental Protection Act 1990). Dumping on private land in Bucks is still cleaned up by the land owner, but council officers do investigate private land fly-tip cases. Where the evidence allows prosecution Buckinghamshire County Council (representing the Waste Partnership) seeks clean-up compensation on behalf of the landowner at court. Over 10% of cases (71 cases from 672 between 2004 and 2018) have been where the waste was fly-tipped on privately owned land. There is no charge to the landowner for investigation work or even for legal fees in these cases (investigation and legal costs are sought at court from the defendant). Investigators do, however, ‘cherry-pick’ reports and investigate only where there is a strong case to pursue. Private landowners benefit as this service is free to them, provides a wider local deterrent effect against dumping, and can even result in clean-up costs being recovered. Investigation work can even have a positive effect where the evidence is insufficient for the case to go to court. Clean-up compensation in all cases is at the discretion of the Court and is awarded by and recovered by the Court following prosecution – it is not paid to the landowner by the councils. Courts are usually keen to award compensation on conviction where the costs have been fully set out and justified. Further cases are anticipated in respect of this dumping and the implications against building trade failure in waste duty of care will be widely publicised. The total ordered against the London builder in this case was £2,033, but similar cases have seen total costs imposed in excess of £6,000. This service provision seems a good compromise between the needs of the private landowner facing the clean-up after being hit by fly-tipping and the restrictions on public budgets. David Rounding is a Waste Enforcement Officer at Buckinghamshire County Council. You can follow him on Twitter @DavidRounding.